How the Tablecloth Dye Sublimation process works. Dye Sublimation Short Description: Dye Sublimation is a process where a solid is heated, turned into a gas, and sublimated into the substrate. The dye sublimation printer reverse prints, (like printing a negative) to special Dye Sublimation paper. The dye sublimation paper is designed to be receptive to dye sublimation inks. Once your image has been reverse printed, it is ready for the big heat press. 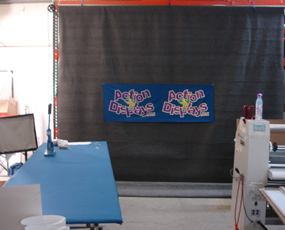 Our dye sublimation heat press has a long, oil filled drum which heats the drum evenly. The Dye Sublimation operating temperature is about 375 degrees F.
Once the heat drum reaches operating temperature, fabric is fed into the heat press. The fabric travels along a series of tension bars, then to a rotary belt table. The table draws the fabric into the heat press. After the fabric has entered the heat press, the dye sublimation paper with your tablecloth image is fed into the heat press. The Dye Sublimation inks, after hitting their sublimation temperature, turn from a solid (on the paper), to a gas and permeate into your tablecloth fabric fibers. Once the Dye Sublimation process has taken place, the colors and images are permanently part of the fabric. You can not feel the difference between the fabric and the logo, such as with heat transfer or the silk screen methods. Notice Grid Alternatives Dye Sublimation tablecloth. Dye sublimation allows for gradient blends, (one color morphing into the next), and allows for images of people or products to be reproduced with true photographic quality. NOTE: As with any reproduced image, the final quality is only as good as the original image or photo. Please see Tech Support: Technical support for large format printing. American Life, Inc. - We did a beautiful set of Dye Sublimated tablecloth's and Trade Show Displays for American Life, Inc. To get their dye sublimated tablecloths to look like books, we brought a couple of books into our photo studio and photographed them in high resolution. We superimposed their logo on the side of their books (tablecloths). The white reflection above and below their logo and tag line is also photo enhanced. This could only have been accomplished through dye sublimation. 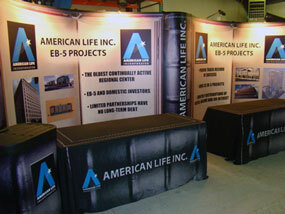 American Life, Inc. also received from us, two ten foot Pop Up Displays. Their two displays are joined in the middle with another book end, creating a twenty foot booth for their larger exhibits. 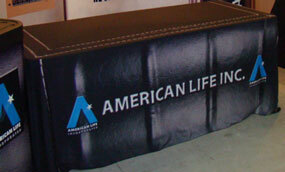 The tablecloth dye sublimation process played a major roll enhancing the American Life, Inc. trade show display. Table Runners, stage set backdrops, trade show displays, table top displays, room dividers, shower curtains, and feather banners have utilized the dye sublimation method. Tablecloth Dye Sublimation does have it's place in the industry! Here is a fitted tablecloth we did for one of our clients. You can see how dye sublimation is the only way this tablecloth could have been done. Rich in detail, dye sublimation delivers the impact you'd expect from a good, quality image. 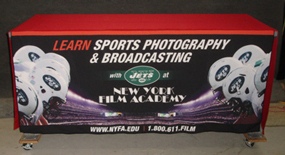 Is Dye Sublimation the Best way to go for advertising on your tablecloth? Not necessarily! We have clients that ordered their tablecloths with the dye sublimation process and reordered requesting our thermal heat transfer process! Why? As with everything in life there is a trade off. While dye sublimation is nice if you're doing the complete face of your tablecloth, dye sublimation may not be the best for your end results. Notice the chart below. Dye Sublimation - Dye Sublimation tablecloth manufacturing may be accomplished in the same day. However the complete dye sublimation process takes longer from start to finish than Thermal Heat Transfer. Silk Screen CAN NOT be done the same day because a screen must be burned prior to the inking, or screening process. Silk Screen - There is a set up charge. That's because the "Screen" itself has to be made. In most cases, silk screen companies send out to a third party that specializes in "burning" a new screen. Cracking of Image - In the old days, there was a cracking of some Silk Screen and Thermal Heat Transfer products. Since those days, technology has improved where cracking is not an issue. The photo to the right shows the exact same image on tablecloth fabric. Our logo to the left was dye sublimated on the tablecloth fabric and our logo to the right was applied with the Thermal Heat Transfer process. Our logo on the left appears deeper in color. You can see our logo to the right has more vibrancy. That's because of the light reflective properties of the "Appliqué." The logo on the left is absorbing more light that the logo on the right. Our logo on the right has more light reflective properties giving it a bit more "Pop." The picture to the right I took about twenty feet away from our dye sublimation test piece. Now notice how the logo on the left is a bit brighter. Both of the logo's are about twenty four inches high, about the size you would have on a normal tablecloth with logo. So is there one best application? Tablecloth Dye Sublimation vs. Thermal Heat Transfer... It really depends on your logo, time allotment to complete the job, and at times, personal preference. Photo taken about twenty feet away from the tablecloth dye sublimation fabric. Give me a call or send me an email with your logo. We'll do a free mock up of your tablecloth for you and discuss the best method for your tablecloth with logo.